Sheila's Eyes - BLIND FAITH LIVE! - Miracle MomentBLIND FAITH LIVE ! Real People. Real Miracles. Sheila Hardin suffered from Sjogren’s syndrome. Dry spots on her eye’s lens caused friction every time Sheila blinked. The vision had become blurred and Sheila faced a future of failing eyesight and chronic discomfort. Sheila’s doctors admit that they have never seen anything like Sheila’s reversal. 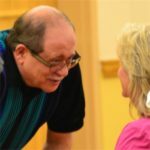 Maria and Gonzalo Lopez presented a number of health issues that the two wanted healed. 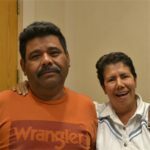 Sciatica, back, and leg pain, glaucoma, and a malfunctioning hand were the reasons for Maria and Gonzalo to attend a Dr. Nemeh healing service. The couple expects miracles, and my how they do receive them. This entry was posted in Dr. Issam Nemeh, Keeping It Real with Kathy Nemeh, Miracle Moments, Philip Keller, Trapper Jack and tagged Back, Hand, Legs, Sciatica, Vision by Philip Keller. Bookmark the permalink. May God grant you healing according to His will, we pray in Jesus name. Please pray for healing of my son ASHWANT who is autistic and also has OCD and epilepsy. I surrender him to our Lord. In Lords name I ask for your distance healing by the power of our Lord. Prayers sent up for your son and your entire family. That is a lot to deal with on everyone’s part. May God bless you and heal your son according to His will, in Jesus name we ask. Thank you for the healing session in the Greenville area SC where Mrs. Linda introduced me to you. If I may ask that you pray that the results of my colonoscopy that may have reviled cancer end up cleaning itself without the need for surgery. In GODS name I pray and ask for your remote healing power granted to you from our Father. Thank you. Prayers sent up on your behalf that the Lord will heal you according to His will. Amen.